If you come from Livigno in Italy via Forcola di Livigno/Fuorcla da Livign/Passo Forcola/La Fórcola (2314m), you will only have to climb a short stretch from La Motta (Dogana) (2055m). 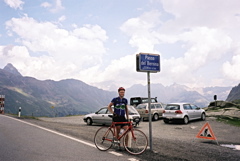 However if you start from Tirano (438m) down in Italy you will have one of the longer climbs in the Alps ahead of you. This climb is irregular and has a long almost flat stretch along the Lago di Poschiavo. The last long part is steep. From the north you start from the Engadin valley outside Celerina/Schlarigna (1728m) (near St. Moritz). There is a relatively short climb with nice views of the Bernina mountain on the climb. Another attraction on this varied climb is the Bernina Express – the highest long-distance railway in the Alps (reaching 2253m), and it crosses the road on the north side (twice). The lower south part is much greener and has some lovely views around Miralago. You can fill up water in San Carlo before the last long steep part up from Tirano starts. There are lovely views of the Bernina mountain on the way up the north side. The road was built in 1865. Before this road was built one would have travelled by the Lago Bianco (2234m) the same way that train goes and this is in fact a different passage from the Bernina passage, but it has no known separate pass name. The Bernina pass goes from Val Bernina to Val da Campasc and Val Laguné, while the train pass goes from Val Bernina to Val da Pila. Lodging in the Engadin valley can be relatively expensive.